A naturally-exfoliating lemongrass-scented coffee scrub made with repurposed coffee grounds. 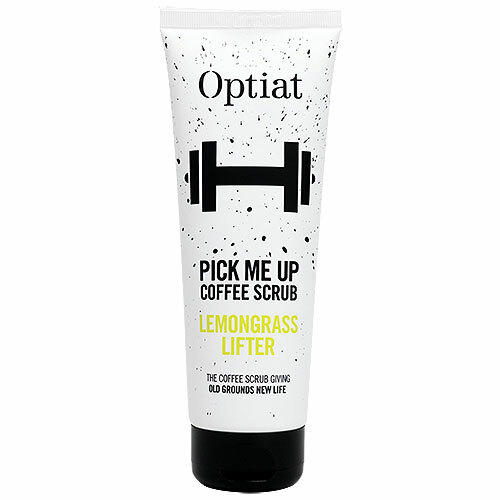 A blend of used Arabica coffee grounds and lemongrass essential oils, Optiat`s Lemongrass Lifter refreshes you after working up a sweat. The coffee grounds act as a natural exfoliator, whilst the caffeine stimulates blood flow, effective against cellulite and stretch marks. Coffea Arabica Seed Powder (Arabica Coffee), Sucrose (Brown Sugar), Sodium Chloride (Sea Salt), Butyrospermum Parkii (Shea) Butter, Prunus Amygdalus Var Dulcis (Almond) Kernel Oil, Citrus Aurantifolia (Lime) Peel Oil, Cymbopogon Citratus (Lemongrass) Leaf Oil, Cocos Nucifera (Coconut) Fruit Extract, Benzyl Alcohol, Dehydroacetic Acid, Benzoic Acid, Sorbic Acid, Limonene*, Linalool*, Citronellol*, Geraniol*, Citral* (*Naturally-occurring). Shake well before use. 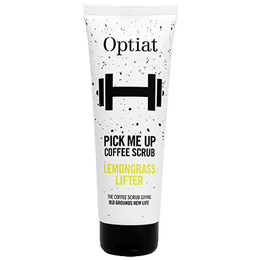 Squeeze out a dollop of this Lemongrass Lifter coffee scrub and scrub into damp skin in circles. Rinse well and enjoy that post-workout fresh skin feeling! Keep out of reach of children and direct sunlight. Scrub may separate when it gets too hot. Cool down to emulsify. Patch test first, at least 24 hours before using. In case of eye contact, rinse thoroughly. Below are reviews of Optiat Lemongrass Lifter Coffee Scrub - 220g by bodykind customers. If you have tried this product we'd love to hear what you think so please leave a review.